Update: The site is now accessible as pre-orders have closed for the day. They will resume tomorrow. Nintendo’s official online store in Japan, My Nintendo Store, has been suffering from a high number of user visits since this morning. 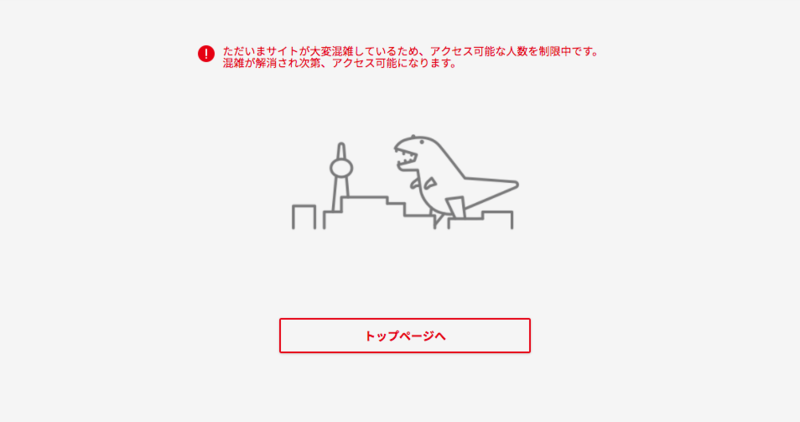 Users have been greeted with an image of a dinosaur and a message saying access is restricted at this point of time due to high load. The reason for the downtime was because infinite pre-orders for the customizable Joy-Con and Joy-Con Strap Nintendo Switch sets began earlier this morning. Pre-orders made today (August 22) are guaranteed to arrive on October 1. By infinite, it means from today onward, anyone could place an order for any number of Nintendo Switch sets, and they would be guaranteed to receive their order. The only thing stopping them is a month or so of lead time. A downtime of this scale has never happened ever since the first Nintendo Switch pre-orders took place on January 21, 2017.